This Vegan Mac and “Cheese” made with butternut squash is a perfect one pot dish perfect for weeknight dinners, and gets bonus points because my kids loved it and asked for seconds! It looks a lot like the boxed Mac and Cheese, but has the sweet taste and rich texture of butternut squash. 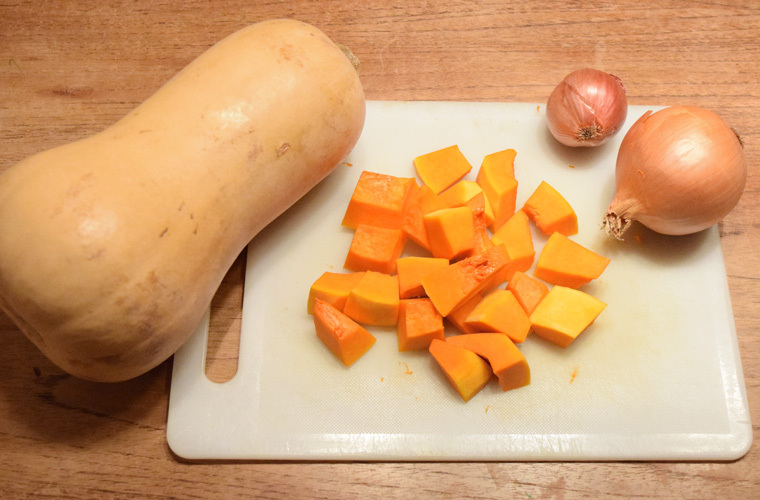 This simple and delicious dish has only 5 ingredients: butternut squash, onion, shallot, water and oil. Start with peeling and chopping up your butternut squash into 1″ cubes. Then dice your onion and shallot.